The Taoiseach has defended the establishment and operation of the Strategic Communications Unit and insisted it is not involved in his personal communications strategy. "The SCU doesn't run any of my Twitter, Facebook or Instagram accounts. 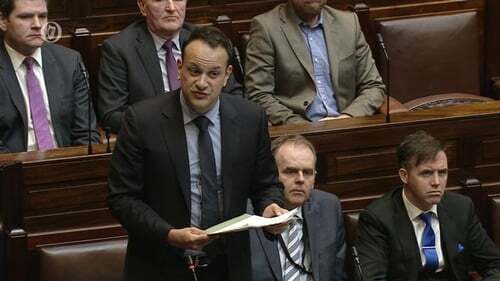 It doesn't record my weekly video or decide what I wear," Mr Varadkar said. "It has minimal input into my speeches and press releases and preparation for interviews. These are all done by me with the help of my political staff." He was speaking in the Dáil after Sinn Féin branded the SCU "a disgusting abuse of power by a Government whose sole interest is not that of the ordinary people but of self-preservation and promotion." Fianna Fáil leader Micheál Martin also accused the Government of using public money to compromise the boundary between public information and propaganda in its operation of the SCU. Mr Varadkar also said his communications style would remain the same, regardless of whether the unit remains or not. "My communications style is different," he said. "It is more direct, more personal, more present and more modern. "Some people don't like it. I accept that. Other people do like and I accept that too. Some people would prefer a more traditional model. "Either way, it is who I am and it isn't going to change, SCU or no SCU." The Taoiseach also defended the function of the unit, saying its remit was to bring consistency and clarity and to treat communications as a whole-of-Government activity. He also said the media buyer in the Ireland 2040 advertising campaign was specifically instructed that all content be identified as being 'in partnership with the Government of Ireland' or 'in association with the Government of Ireland'. Explainer: What is the Strategic Communications Unit? Speaking during a debate on his party's motion calling for the disbandment of the SCU, Sinn Féin's finance spokesman Pearse Doherty said the unit represents "a shameful misuse of the public purse". He said "notwithstanding all of the other arguments which may be made", it is abhorrent to think that taxpayers' money that could be spent on schools and hospitals and public housing was instead used to promote a political party and its agenda. Calls for the closure of the SCU follow a controversy over newspaper advertorials promoting Project Ireland 2040, which were placed in local and national media, and paid for by the Government. The advertorials were criticised for featuring Government election candidates, and for carrying comments from interviewees who were not informed of the purpose of the articles. Mr Doherty said there was an addiction to spin at the heart of Mr Varadkar's Government. Referring to a story broadcast on RTÉ's This Week programme, he said revelations at the weekend about an attempt to establish a campaign based on garda figures that the CSO refused to stand over "is just the latest example of that." He said €5m could have been used to fund 1,000 community employment places, or to reverse the cuts made to small schools, or to introduce a living wage right across the civil service. Responding to the motion, Tánaiste Simon Coveney accused Sinn Féin of hypocrisy. He said the former leader of Sinn Féin was willing to support the SCU on the basis that they might help win a referendum on Irish unity. "Good clear communications is a virtue of a Government," he said. He said Sinn Féin did not want good communications coming from Government because it did not suit the party's political agenda. He said communications across costs around €170m a year. "The whole point of this, was to spend some money to ensure that we provided value for money in those efforts," he said. Finance Minister Paschal Donohoe said he supported the work of the SCU because citizens have a right to know how their money is being spent. "I understand the need of Sinn Féin to focus in on Ireland 2040 because they are scared that a plan does exist for their country," he said. "I didn't hear them make the same point when the Government was using the SCU to provide information about benefits which might be available to the unemployed." Mr Martin also said the unit was a personal project of the Taoiseach, who asked that it be established, appointed its head and secured its budget. He also accused Mr Varadkar of trying to withhold information on the unit. "The entire purpose of this unit political. It is being set up ... for the sole purpose of promoting the political message of the Government," Mr Martin said. Labour TD Sean Sherlock said his party would support the Sinn Féin motion to disband the Strategic Communications Unit. He also called on the Government to honour the vote should it be successful. Mr Sherlock said it is not yet known how much the advertorials for Ireland 2040 cost the taxpayer. PBP-Solidarity TD Bríd Collins said the idea that regional newspapers were not leaned on during the advertising campaign was "farcical." Independent TD Mattie McGrath said the Taoiseach was like a spinning top that was now out of control. Earlier this month, Mr Varadkar ordered a review of the unit to be carried out by the Secretary to the Government, Martin Fraser. Mr Varadkar also sought changes to the protocols surrounding the purchase of advertising space in newspapers.